One of the best parts of owning an Amazon Echo is watching its virtual voice assistant, Alexa, mature with age. In the past year alone it's learned what time restaurants close thanks to Yelp integration and can tap into Audible to read you a bedtime story. 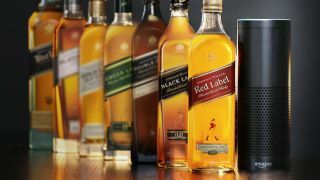 But Alexa's latest leap forward – well, more of a stumble really – is something a little kid-friendly: Johnnie Walker Blended Scotch Whisky has teamed up with Amazon to develop a skill that will teach you about 150 years of whisky in a matter of minutes. The distillery released the skill today on the Amazon Echo Skills section of the Alexa app and besides general information about the different labels, the app can offer guided whisky tastings, dole out drink recipes and direct you to the closest location – hopefully within walking distance – where you can stock up on the libation. "We're delighted to be collaborating with an iconic brand like Johnnie Walker," said Rob Pulciani, Director, Amazon Alexa in a statement. "The Johnnie Walker skill dives deep into the world of whisky in a fun and engaging way through recommendations of blends, practical whisky tips and more – all just by using your voice. Now our customers can entertain at home in a unique way with the hands-free convenience of Alexa." The Amazon skill is one part of the label's digital mentorship program that encourages those who are unable to make it to one of the brand's tasting rooms to learn more about the drink. The initiative also includes a Facebook Messenger bot that offers similar functionality. If you're anything like me, although you probably don't need any more encouragement to drink whisky, the idea of learning more while you drink from the comfort of your own home is a relatively good one ... at least until the hangover hits tomorrow morning.